The Saluki is one of the oldest dog breeds in the world. This breed of dogs was developed in the middle east. They are known for their high intelligence and expressions, they are honored champions to Egyptian nobility. 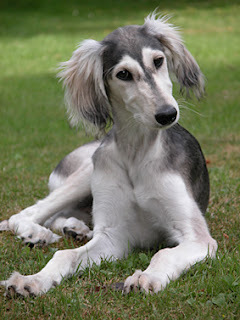 Saluki dog breed are good hunter and used to hunt small animals, this breed of dogs is gentle and sensitive. They are very loyal to their family, brave and alert, they are also known for their speed and hunting instinct. The saluki is one of the most reliable breed of dogs, they are loyal to their family and can show lots of attachment with one member of the family. They love to be with children and do well with older sensible kids, they are suspicious of strangers and do no do well with other pets and dogs. They are indoor dogs and do well inside rather then outside. Saluki become destructive if they are left alone for long periods of time. This breed of dogs has two coat varieties the smooth and feathered and the other one is short and close. Their coat comes in different colors which include white, cream, fawn, golden, red, black and tan. It may also be tri-color white, black and tan. They are minimal shedders and are odorless. Saluki require early age training and obedience training should be given to them with fairness and patience, they will not respond to the hard and harsh methods of dog training. They are very good learners, this breed of dog is highly energetic and naturally athletic. They are not good for small apartments they need a lot of exercise to remain fit. The Saluki love to go for a long walks and enjoy the family play sessions, they have a ability to reach speeds of up to 50 mph. This breed of dogs is easy to groom, they require occasionally brushing and bathing should be done when it is needed. Like most other dog breed the Saluki also suffer from some breed specific dog diseases and health problems. They are also prone to bloating, hip dysplasia, skin problems, and cataracts. This breed of dogs can also get sun burnt very easily especially on the nose. Their average lifespan is around 10 to 12 years of age.